Almost half of American voters continue to view Sarah Palin unfavorably and most would not heed her political endorsements, a new CBS News/ New York Times poll shows. The former vice presidential candidate's favorability rating has declined slightly since August, with 46 percent of surveyed voters viewing her unfavorably and 21 percent viewing her favorably. Thirty-two percent of voters said they were either undecided or hadn't heard enough to have an opinion, according to the poll, conducted Sept. 10-14. Last month, 23 percent of voters viewed Palin favorably, whereas 40 percent viewed her unfavorably and 35 percent didn't know. However, Palin continues to enjoy support among Republicans, conservatives and - in particular - Tea Partiers: 56 percent of Tea Party members, 50 percent of Republicans and (a net positive of) 38 percent of conservatives said they have a positive opinion of Palin. Democrats (68 percent) and Independents (a net negative of 45 percent) said they had a negative opinion of Palin. 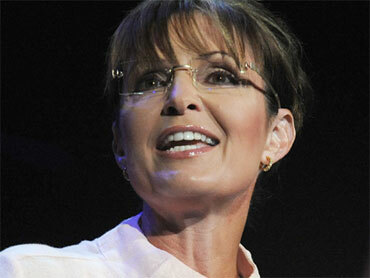 Many voters said they would be less likely to vote for Palin-endorsed candidates, the poll indicates. Twelve percent of all voters said a Palin endorsement would make them more likely to vote for that candidate, while 37 percent said it would make them less likely to do so. But 48 percent said it made no difference. Two in three voters overall said they believe Palin's endorsements are motivated more by a desire to stay in the public eye than an interest in electing conservative candidates, but Republicans and Tea Party members are more divided. Among conservatives, 29 percent think she is more concerned with electing conservative candidates, while 53 percent think she mostly wants to stay in the public eye. Of the 43 candidates Palin has endorsed, 25 have won primaries, 11 have lost and 7 have not had to face a primary, according to the Washington Post. Meanwhile, all voters struggled to pinpoint a strong Republican leader: When asked which public person best represents the Republican party today, 62 percent of those surveyed - including 51 percent of Republicans - could not name someone. Among those who did, Sarah Palin was the top mention with just six percent, followed by John McCain (five percent) and Newt Gingrich (four percent). Among just Republicans, six percent named Palin, three percent named McCain, eight percent named Gingrich, and one percent named both Boehner and McConnell. As for the top Republican leaders in Congress, just 35 volunteered House Minority Leader John Boehner, and only one percent of Americans mentioned Senate Minority Leader Mitch McConnell.